I'm not sure if you struggle with the same insecurities that I struggle with but you may struggle with this one. See I struggle with finding value in my grade. I didn't realize this until recently but it became extremely evident to me that when I get a bad grade in seminary, or school in general, I get frustrated. This last summer I took a course called "God in Science and Scripture". In that course I was asked to write a final paper. Through a random series of events I found out that I got a "C" for the final grade of my course. Now I could vent about the circumstances that lead to that grade but its in black ink already so its pointless. After receiving the "C" letter grade I found out that I was super bummed on the grade. I felt like I had put so much effort into the course but obviously didn't learn the requirements for passing the course with a better grade (random side note: a "C" is passing). Last summer I learned that for so long in my life I have found my value in a grade. I find my value in acceptance from others and that is a tough place to wrestle with. Since getting that grade I have done my best to find my value in Christ. I most of the verses; I have heard the sermons... shoot I have preached the sermons but God brought me to a place in life where I had to find my value in him and not in a prof that I will most likely not see again until heaven. What is there in your life, today, that is holding you back from finding your value in Christ? What is getting in your way from really becoming the person that God is asking you to be? Almost a month ago I made a pretty big slip. We had taken a week long vacation to the East Coast to see our family. We were driving down from Hershey, PA to North Beach, MD. 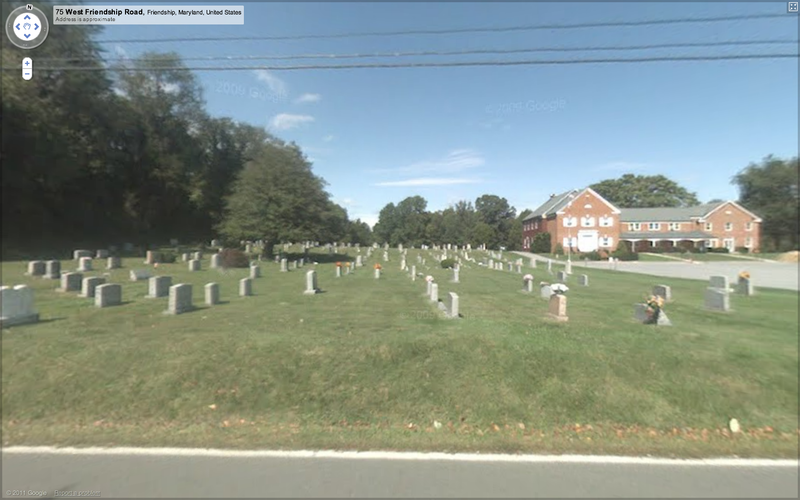 We were on highway 2 just south of Annapolis and as we were passing this Cemetery I pointed it out to Charity and said: "Look at that seminary!" See so many times I have heard people relate "seminary" to a "cemetery". Hearing that so many times, and the point of life I am at with seminary, I am starting to think the joke is not a joke. I do not personally know anyone that has attended seminary and left the church but I have heard the stories. I have heard the stories of people who were passionate about their faith and left seminary less than excited about the Gospel. Being the competitive person that I am I love to try to break stats and not fall into the junk that I hear others fall into. The sad thing about the point I am at in seminary right now is that I am starting to believe that seminary is more like a cemetery than a training ground that fans the fire of your passion for the Gospel. This could be my personal journey with seminary (been working on it for over 5 years), the stage of life we are (two little kids who miss their daddy because he has to do homework), or the fact that I am just sick of sitting at my kitchen table late at night while my wife spends time alone. When Sophie turned two years old I got her handprint because I wanted to get a tattoo of it. 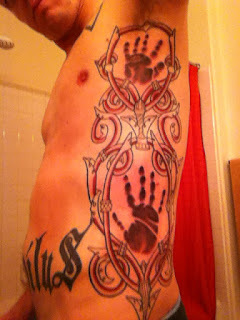 I had been talking to my tattoo artist about getting both the girls handprints at their two year old birthday. 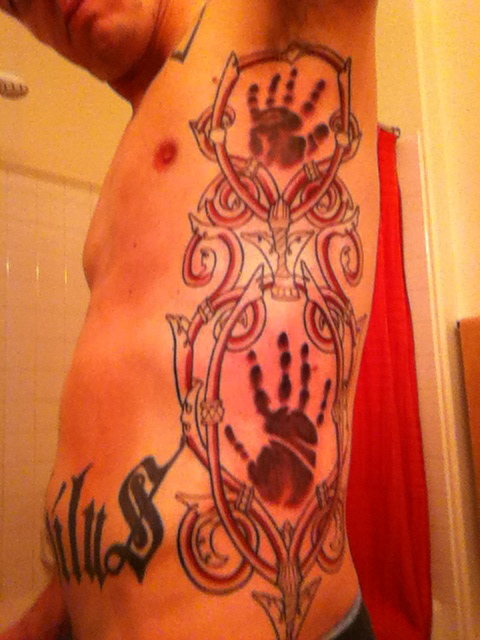 The plan was to get their handprints on my left side because I have a piece for Charity on my right side. I wish I could remember when we started this piece but I can't. I think we may have started it back in December but I am not sure (it may have been October). Here is a picture after the third session. First session was to do Sophie's handprint and the frame that surrounds it. Once we did Sophie's handprint it became evident to me that I was not going to be able to wait until Leah turned two and needed to get her handprint quickly! Session two of the tattoo was placing Leah's handprint above Sophie's in a frame that matched what we did for Sophie. The picture defiantly shows the work we have done and how amazing this piece is looking! For the third session we filled the girls hands in and began to color in the frame. The color is hard to see but when it's finished the frame will be gold and have the girls birthstones near their hands. I am super stoked on how this is turning out; honestly its about a hundred times better than I could have ever imagined it would look. My girls will always have a place in my heart and their handprints will always be marked on my side. They are my girls and it is my role to love them, protect them, love them some more, point them to God and father them well. Its almost June and that means that our seniors will be graduating from high school very shortly. Last night we had our annual senior grad night. The night is really a time to honor the students who are graduating, allow our adult leaders to share some funny stories and invite their parents to watch. This event has morphed for us over the last six years, since I have been here, and I think last nights was the best we have had! We originally started doing this event on a Friday night and inviting just the families of the graduates and their parents. The night was good but I feel like we were missing something; the rest of our high school ministry. After that we changed to doing the event on a Wednesday night at Explode. This allowed our students to see how important graduation was and gave parents a snap shot of what their student experiences at our high school ministry. Grad night has always been a tough night for me and last night was no different. The most difficult thing about high school ministry, for me, has been investing into students for four years and then watching them leave the nest. Last night I looked at young men and women who have given their life to Christ in our high school ministry, been baptized at our church and serve here. It was tough. There are students I have known since I moved to Vegas and its been a huge blessing to watch them grow in their faith and reach out to their friends on their campus. "Just because you graduate from Explode does not mean you are graduating from my life"
I love you class of 2011 and I am so proud of you! Explode Alumni Video from Neal Benson on Vimeo. Yesterday was a special day for me. Let me say that again; Yesterday was a very special in my life! Yesterday Charity dropped Leah off at church and we (Leah and I) went on our first date! I tried to ask Leah where she wanted to go but didn't get much of a response so I decided to chose the place (this is why she looks confused in the pic). We went to the District and grabbed some stuff from Coffee Bean and Tea Leaf. The date was so cool for me to get some alone time with Leah and just get to know her more. I was able to hold her hand, hold her, laugh with her, smile with her and just spend some time for the two of us. We got to the table, outside, and I envisioned what this date would look like in twelve years. I envisioned what she would want to talk about. I envisioned what she would be in to. I envisioned what she would order and how her hair would look. I got scared after that so I just came back to today and enjoyed the time that I was getting with my fourteen month old! Yesterday was the first date, of many, that I plan of taking Leah on. I left our date with a greater sense of responsibility as a dad and the role that I play in her life. See this post isn't really about potty training my daughter. While I was thinking about the text, in church, it made me think about how my life is kinda like potty training. I envision God as the nice dad who is patiently teaching me how to live life without "going" on myself. I envision my life kinda like my daughter. I am trying so hard to go in the toilet but every now and then I just can't hold it and mess up. The great thing about God, in these situations, is that he doesn't blow up on us. He isn't livid when I can't make it to the toilet. Life is pretty much like potty training. We are all going to mess up (and make a mess). Some of us are further along in the process of others. Some of us get trained quicker than others. Some of us still wet the bed at night. Some of us can hold it all day and all night. The thing to remember is that we serve a gracious God who is right there to help us as we venture through life and figure it out. God wants to be there to help everyone of us grow in life the question is: "Will we accept the help?" I like to brag that I have the coolest small group. Maybe its not a brag but just my opinion. This Saturday my family was out of town and I needed to do something crazy so I invited my small group! Not everyone was able to make it and we even had a few other guys show up but we did have fun. We went out to Nelson's Landing which is on Lake Mojave and did some cliff jumping. Normally I go out there later in the year and the water is warm and the days are hot. This day was a little different... Ok, a lot different. It was super windy when we got out there and no warmer than 80 degrees. I think I was the first to jump in and it was COLD! My buddy later told me that the water temp was around 60 degrees. Some of the guys jumped a few times but most of us jumped once or twice. We ended up leaving early because it was so cold but made a stop at some of the old mining caves on the way home. Now I have gone in these caves a few times and they are pretty cool. They are not caves that you have to crawl to get any where and there are some areas that are very open. We took the guys down in the caves for a little while and did some exploring, rock throwing and trying to scare each other. The day was not what I expected but was a great day to get the guys out of their house and just spend some time together! That may sound weird for some people "family walk"
See family walk gives me some time to really connect with my family and focus on them. It gets us out of the house, away from the TV and outside with each other. It is something the girls look forward to! It allows them to run around, in the grass, get some fresh air and take out their cool toys (Leah rides the braught braught and sometimes Sophie rides her scooter). When Sophie was younger she LOVED the braught braught and now she has passed that fun on to her sister! Today family walk was missing Charity so I decided to film a little video of Sophie and how big she is getting! She is getting pretty good at her scooter and maneuvering it all over the place on our walk. Today she took a break from the scooter to go lion hunting also! 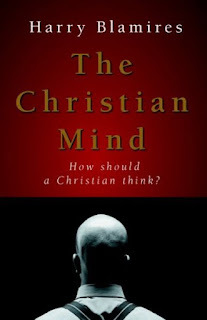 Title: The Christian Mind: How should a Christian Think? Favorite Quote: "If Christians cannot communicate as thinking beings, there are reduced to encountering one another only at the shallow level of gossip and small talk." Review: To start out honestly this book bored me to death for the first forty pages! I really thought that I would never finish this read. Maybe it was due to taking a few day off of reading or just something else this book became alive to me! I began to see, and understand, what Blamires is talking about in this book. 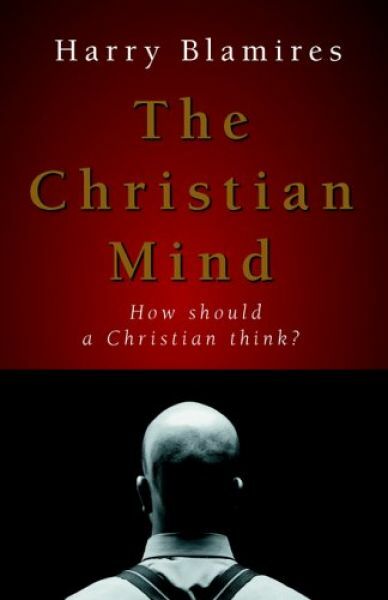 I started to understand the concepts he was presenting and how he continued to share that Christians do not know how to think like Christians. At first I was a bit upset but as I continued reading I began to understand what he meant and came to the conclusion that he is right. We have Christians in this world that are more concerned with thinking about politics than thinking like Christians. There are people in this world who call themselves Christians that care more about being an American than being a Christian. Being a Christian causes your life to be altered; it changes everything in you and about you. You begin to think differently, act differently and engage the world differently when you surrender your life to Christ. The sad thing it that far too many people are a Christian in their heart and not in their mind. I am going to recommend this book to you if you want a challenge in your life. If you want to read some words that are going to shake your thoughts in life than run to order this book today! But if you want to just keep living how you are living then don't read this book. This book will require you to think about how you interact with the world around you and how you can engage it as a Christian! Favorite Quote: "Yes, Mommy, I remember," he said. "Thats where the angels sang to me." 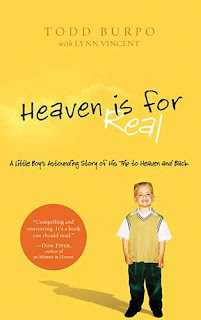 Heaven is for Real is a book that you will only want to read if you are ready to cry. I think that crying is good for the soul for everyone (even though I struggle with it) and therefore I recommend this book to everyone! If you have ever had a question in your mind about the existence of heaven I think this book will help you to find some compelling evidence from the mind of a young child. The story is about a 3 year old boy who visited heaven while in surgery. I don't want to give away the entire story about what the family endures while their son is in the hospital or they pain they experience but I think the read is worth it. I understand that the thought of heaven can be a tough thing to speak of but I also think that we need to think towards heaven and not just about getting there ourselves. I think we live in a society that needs the hope of Christ in their life! On a personal note it really brought up some emotions inside me that struck deep when our daughter was in the hospital and the pain that Charity and I endured in that time in our lives. The book brought tears to my eyes just thinking about my little girl sitting in the NICU and the pain from that. I truly felt with the dad who was enduring this painful situation. Back in December Charity and I planned a family vacation back to the east coast to visit our sisters who both live back there. The first night we landed at BWI airport and headed straight to the Jersey Shore and stayed at this little cabin for two nights. We got in pretty late Friday night and were hoping that our girls would sleep longer because of the time change but that was a joke! We got up early on Saturday morning and headed over to the boardwalk. I have never been on the east coast (except Florida) and this was cool. We went to one of those typical boardwalk adventure parks. It was super fun to take Sophie on the rides and then to watch her ride them on her own. I just keep thinking how quickly my little girls are growing up. Here is Sophie, Leah and their cousin Blaze riding one of the boat rides that they had their. It brings back cool memories for me because I have seen a picture of me riding in a very similar ride when I was younger. Going on this vacation was cool to spend some time with our family and get to let our girls connect with their Aunts and Uncles.